Evan is doing well. He has taken a few steps here and there but is mainly walking around the furniture. He still stands very well by himself. He is getting so big! In 6 weeks he'll be one! I can't believe it! This first year has gone by way too fast. We are getting ready for a trip up to NH to visit Eric's family. I am so excited. Eric's family hasn't seen Evan in awhile and I think they will be surprised at how much he has changed. I hope the flight up there goes smooth. Evan hasn't been on a plane yet and I'm a bit nervous about how he will do. We fly out Friday and I will be there for about two weeks. Eric is staying a few days and then will fly home. He'll be back up to get Evan and me on the 17th. It's going to be a great visit! 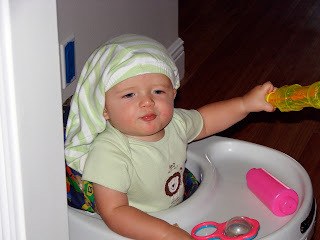 Here are some pics of Evan. 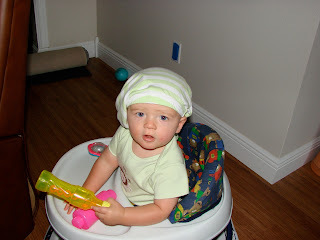 Two of them are of him with his pants on his head and the other is in the bath with fun foam shapes that mom cut out. 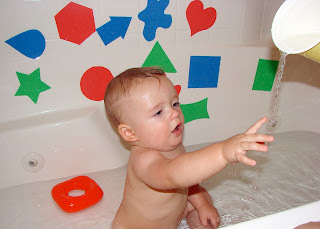 Apparently, the fun foam sticks when it gets wet. Fun! 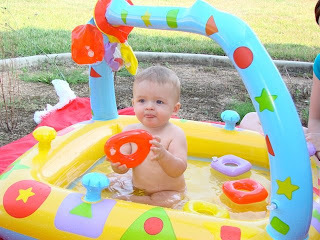 Here is video of Evan standing and clapping while in his pool. He's so big! Evan is having a great time here in Pensacola. 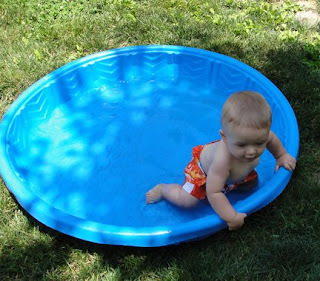 I got him a blow-up pool a couple of months ago and we were able to get it out and use it while we're here. It's hot! 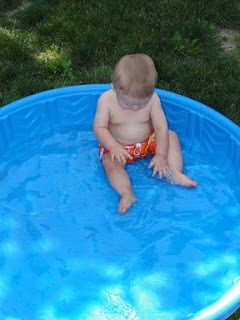 He really enjoyed it and actually sat and splashed. He has been standing a lot and he has even been letting go and standing on his own. Sometimes he holds onto the couch and walks a little but he's constantly up and down and moving around. He is a busy boy! 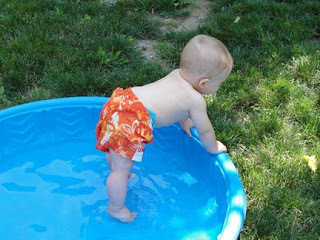 Here are some pics of him in the pool. 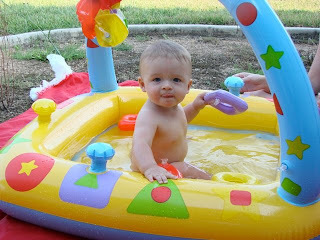 This afternoon, I took Evan outside for a little kiddy pool time. He liked it but he was trying to stand up and never really sat and splashed. Twice he fell...half in the pool and half in the grass. The last one finally ended the fun. I did get a few cute pics before the fun was over.